This automation system was designed for use in an industrial shop environment where large, heavy pieces of glass are cut. The glass cutting process where this system was installed had previously been carried out by hand. This wrap around cart, single axis linear actuator was designed for an automated bag sealing and cutting system for a client in the medical industry. Used to seal and cut IV medical bags, Macron engineers designed a wrap around cart in order to increase moment load capability of this actuator. 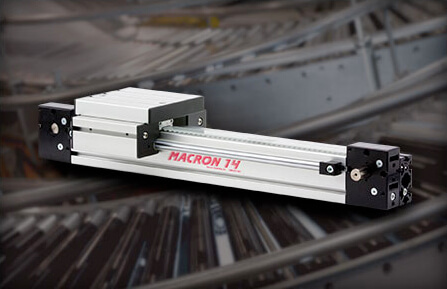 The standard Macron 14 linear actuators are designed to handle loads up to 200 pounds, travel at speeds up to 160 mm/sec, and provide repeatability of +/-0.025mm.